It’s all too easy to fall back on the, “We’ve seen it all/done it all,” perspective of modern ennui. While on one hand, we are seeing more and more subdivisions and chimerical stitching together of genres, the bedroom breakbeat garage popedelica of the world, we are starting to see new forms and structures emerge, thanks to the savvy application of technology. On Clast, Cincinnati producer Kevin Poole, aka Umin, chops and sculpts a variety of stringed instruments into 4-dimensional polychromatic sculptures that unfold over time, in an explosion of color, tonality, and creativity. Clast is constructed from the unlikely source material of a baritone ukulele and guitar. Usually these two instruments conjure images of twee folk music — something with a hand-knit owl on the cover, perhaps — but Umin weaves these rootsy threads into a vibrant technicolor holographic tapestry, somewhere between the junkyard raves of the excellent Congolese band Konono No. 1 and the 3D hyperreal casinos of vaporwave’s global marketplace. 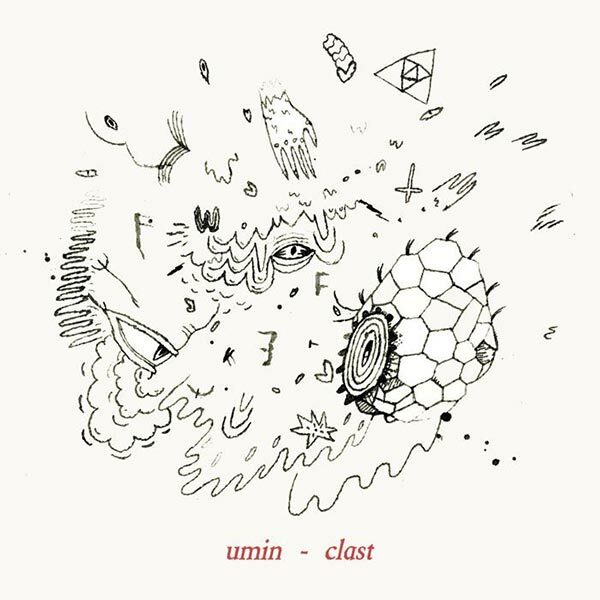 Some of the song titles on Clast seem to hint at Umin’s motivation. “Carbon”, the title of the album opener, is the building life of all organic life as we know it. Similarly, the mutated string lines, bleeping 8-bit synthesizers, and ping-pong rhythms serve as a template for all 12 of Clast‘s songs. If “Carbon” could be seen as a mission statement, a getting back to the basics, then “Node” is where Kevin Poole begins to put the pieces together again. The line drawings of William Test, that serve as the album artwork, seems to reinforce the musical output, with some abstract ink squiggles free-floating in mid-air while others cohere into organic shapes, beehives and spiral vortexes. 2014 might be remembered as the year that IDM made its comeback, with notable new releases from leading lights like Aphex Twin, Squarepusher, and Mouse On Mars. Perhaps this is a sign of electronic music’s return to futurism, where we set our sights on the new, on the never before seen. Umin’s music, however, could be seen as both completely futuristic and utterly ancient. They call it IDM gamelan; machines replicating the sound of ancient trance musics. And like gamelan, Clast will shut down your central computing system with its dense layers of rhythms and melodies, which will leave you swaying and seeing mechanical wasps. Ultimately, Umin and like-minded producers, may succeed in creating a new form of folk music, similar to the way that Battles redefined the possibilities of minimalist, repetitive rock music with their blend of metal mastery and technology. Clast will change the way you listen to, and think about, acoustic instruments, as the imaginary walls between folk and futurism, organic and electronic, continue to crumble.